Neurology is a branch of medicine dealing with disorders of the nervous system. Neurology deals with the diagnosis and treatment of all categories of conditions and disease involving the central and peripheral nervous systems (and their subdivisions, the autonomic and somatic nervous systems), including their coverings, blood vessels, and all effector tissue, such as muscle.Neurological practice relies heavily on the field of neuroscience, which is the scientific study of the nervous system. 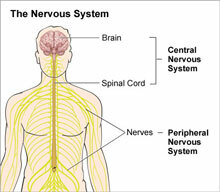 The nervous system is a complex network of thread-like nerves and cells that carry messages to and from the brain and spinal cord to various parts of the body including the sensory organs, arms, hands, legs, and feet.he nervous system has three main functions: sensory input, integration of data and motor output. Sensory input is when the body gathers information or data, by way of neurons, glia and synapses. The nervous system is composed of excitable nerve cells (neurons) and synapses that form between the neurons and connect them to centers throughout the body or to other neurons.